Welcome to Redlands Healthcare Center. Redlands Healthcare Center is proud to be a five-star, Medicare-certified, short-term rehabilitation and skilled nursing home located in Redlands, California. 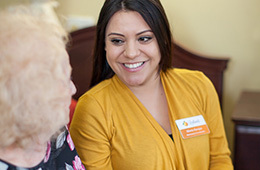 As the premier skilled nursing facility in Redlands, California, we provide compassionate and personal skilled care 24 hours a day. We specialize in providing rehabilitation services onsite to help our residents regain their independence and return home. "Serve more people, touch more lives" is our pledge and promise. We have been serving the community for many years and our team oriented staff with their experience and exuberance is dedicated to giving our residents the highest quality of care.